There are numerous cities across the United States that serve as the perfect summer vacation destination for seniors. Many vibrant locations offer a wealth of fascinating history, several spectacular views, and a variety of delectable cuisine choices. There are also accommodation, dining, and transportation options to fit a senior’s budget. Here are the top 5 summer vacation options for the elderly. In this city, seniors can enjoy a horse-drawn carriage ride through the Historic District and visit the Boone Hall and the Magnolia Plantations to satisfy their love for history. Fans of military history can enjoy touring Fort Sumter and the Patriots Point Naval & Maritime Museum. Seniors can also take a sunset cruise aboard a schooner or take a culinary tour and indulge in the best of Southern-style cooking. Although traveling can be healthy for seniors, there are several diseases that can prevent them from getting out of the house. Seniors can face a variety of age-related challenges. Though some families choose to take on the caregiving duties, there may come a time when they need a trusted Roseville home care provider. Families sometimes need respite from their duties so they can focus on their other responsibilities, and some seniors need around-the-clock assistance that their families are not able to provide. Home Care Assistance is here to help. During the summer months, the Aspen, Steamboat Springs, Telluride, and Vail ski resorts are the perfect vacation destinations. These Rocky Mountain locations offer spectacular scenery day and night, and the elevation creates cooler temperatures. Accommodation options range from boutique bed and breakfasts to five-star hotels. Seniors can enjoy a variety of activities such as biking, hiking, riding a gondola, and relaxing in natural hot springs. They can see a professional rodeo, enjoy the shopping, and feast on the delicious cuisine options. This Florida island community remains one of the most popular vacation destinations for older adults. The city offers iconic pastel-colored homes, great shopping opportunities, and a laid-back atmosphere. Stunning beaches provide the chance to relax, and the coral reefs attract snorkeling enthusiasts. The Cuban influence on local cuisine makes for a variety of delicious meals, and the beachfront has several dining options to choose from. This Pennsylvania city is ideal for older adults who love history. Points of interest include the Franklin Institute, the National Constitution Center, and the African American Museum. Seniors can tour the Chinatown, Rittenhouse, and Washington Square West regions. Cuisine options are also exceptional with a variety of traditional family-owned restaurants serving popular dishes. Philadelphia has various public transportation options, which makes traveling around the city easier for aging adults. This scenic coastal location is a wonderful destination for seniors who want to relax and enjoy the warmth of the sun on the beach. The summer temperatures are also manageable and rarely exceed 80 degrees Fahrenheit. 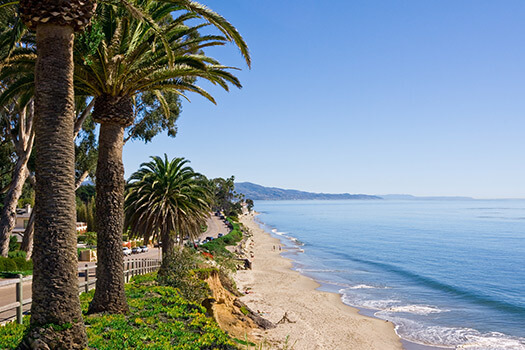 Seniors can learn about the history of the city by visiting the Old Mission, strolling along Stearns Wharf, or venturing to the Santa Ynez Valley region and indulging in wine tasting. Cuisine options are plentiful and range from Italian to Mexican, and the city’s coastal location means seafood is fresh and abundant. Renting a car to get around is the perfect way to explore the city and the interesting surrounding locations. However, public transportation is also available. Many seniors prefer aging in the comfort of their homes, and they can benefit from high-quality at-home care services. If your aging loved one needs occasional help with bathing, grooming, cooking, or other basic household tasks, or if you need time to attend to important personal matters, reach out to Home Care Assistance, a leading provider of live-in and respite care. Roseville seniors can maintain their independence while living at home with the help of our reliable respite caregivers. Living with a serious health condition can make it challenging for seniors to age in place. However, they can maintain a higher quality of life with the help of professional live-in care. Roseville seniors can benefit from assistance with meal prep, bathing, transportation to the doctor’s office, medication reminders, and much more. To create a customized care plan for your elderly loved one, call Home Care Assistance at 916.226.3737 today.